After more than 1½ years of work, the University of Missouri-Rolla team's house was assembled on the Mall and ready to compete. In the fall of 2002, teams from colleges and universities across the United States competed in the first-ever Solar Decathlon. 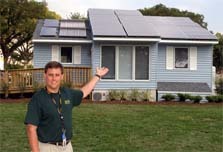 The teams assembled highly energy-efficient and completely solar-powered homes in a "Solar Village" on the National Mall in Washington, D.C. They competed in 10 contests that tested architectural and engineering design, energy efficiency, energy production, and more. In the overview, you can learn more about Solar Decathlon from the early stages when the teams began to design their houses in 2000 through the competition itself. You can also learn about the contests and results from the 2002 competition, the rules, the teams and their homes, and where their houses are now. A full report of the 2002 event, Solar Decathlon 2002: The Event in Review, is also available electronically. Download Adobe Reader.